Stainless steel pressure transmitter with ranges from 100mbar up to 40 bar gauge or absolute with optional accuracy ranging from the standard 0.35% FS up to 0.1% FS. Special options such as ATEX/IECEx approval, SIL approval and compound ranges are also available. Media Compatibility: SS316L diaphragm and process connection with FKM, EPDM or all welded seals. The DMP 331 precision pressure transmitter is a silicon strain gauge based sensing device with high repeatability and low pressure hysteresis measurements. The silicon chip is isolated from the pressure media by a thin stainless steel membrane and silicone oil fill. The high sensitivity of silicon semiconductor strain gauges facilitates low pressure ranges down to as low as 0 to 100 mbar and because of the metal capsule construction it is compatible with wet media. The electronics offer flexibility of output along with improved linearisation options for better measurement accuracy. The DMP331 has been hazardous zone approved for use in work areas that may contain flammable or dusty atmospheres. There is also the option for SIL2 approved electronics where more stringent reliability and safety is required. Monitor the trapped atmospheric pressure within a submerged cabinet to provide an early indication of when water breaks through the walls of the cabinet. Measure the level of biodiesel with this hydrostatic pressure transmitter. Current-output barometric pressure sensor to measure the pressure of the atmosphere around a coal-fired smokestack. ATEX approved 4-20mA pressure transmitter to measure water pressure in an automatic fire suppression system. 800-1200mbar sensor, with 4-20mA output to be used on environmental monitoring installation. Monitor the low pressures generated by gas recovered from landfill sites. Measure the pressure of liquid petroleum gas on pressure reducing stations in a ATEX approved hazardous area zone. Monitor the boosted bio-gas pressure from an Anaerobic Digester. Is this pressure sensor suitable for use in a zone 1 area with a barrier? The ATEX certification marking is II 1G Ex ia IIC T4, therefore it is suitable for ATEX zone 0 and below, and must be used with a suitable intrinsically safe barrier and installed to ATEX approved standards by certified electricians or electrical contractors. Does this device need re-calibration, since there will be no chance to work on it once installed? You cannot adjust the output of the sensor which is fixed at the factory. All sensors drift slightly over time to varying degrees, so it is important to check them regularly and make necessary adjustments to the signal conditioning instrumentation. This is normally required as part of ISO9000 quality assurance practices. What kind of ATEX certification group/zone does the DMP331 have? What is the maximum temperature that the DMP 331 can withstand? For the standard DMP 331 without intrinsic safety approval, the maximum media temperature is 125°C / 257°F, and the maximum environmental temperature is 85°C / 185°F. What is the measurement response of the DMP331? What is the resolution of the output signal from the DMP311 precision pressure transmitter for the different accuracy options available? The DMP331 with the accuracy option of 0.35% FS or 0.25% FS IEC60770 accuracy has a resolution of 11 to 12 bits, 2048 to 4096 steps or 0.04882% to 0.02441% span. The accuracy option 0.1% FS IEC60770 has a resolution of 14 bits, 16,384 steps or 0.0061% span. We require pressure sensors for a remote gas pressure monitoring system we are designing to be used on a large commercial network. The operating range will be 0 to 300 mb with an average pressure of 150 mb, and the pressure sensors will need to be ATEX/IS certified. The sensors will be installed in existing pipe work stab-ins with bsp fittings in a large walk-in gas meter housing. We hope to have live data modelling of the network pressure with alerts of low/high pressures to the BMS front end viewing system. We would suggest the following DMP331 specification for measuring over a 0 to 300 mbar gauge range and installed in an ATEX IS protected area with an appropriate IS zone barrier. I normally purchase a DMP331 stainless steel pressure transmitter with the code B accuracy of 0.2% FS (IEC 60770), but I cannot find it mentioned on the specification data sheet, is it a specially requested option? The DMP331 accuracy option 2 (code B) for pressure ranges ≥ 1 bar of ≤ ± 0.20 % FSO (IEC60770) ≤ ± 0.100 % FSO (BFSL) has been recently been made obsolete. Alternatively you can select the new more accurate option 2 (previously option 3)(code 1) of ≤ ± 0.1 % FSO for all pressure ranges or the slightly less accurate option 1 (code 2) for pressure ranges ≥ 0.4 bar: of ≤ ± 0.25 % FSO. I am interested in the DMP331 pressure transducer for use on a pneumatic system. The 2.5 bar transducer has a rated over pressure of 10 bar, does this mean that if a pressure is applied between 2.5 and 10 bar, there will be no calibration shift of the transducer output signal? Do we need to install a solenoid valve to switch between the 2.5 bar range and a transducer with a range up to 10 bar, or can both transducers be connected permanently on the same measurement line? The rating is intended for a temporary overpressure so we would suggest using a solenoid valve to protect the lower range sensor where an overpressure condition is expected to occur over a long duration or significant proportion of the transducer’s service life. What is the input voltage for the DMP331 with 4-20mA output and ATEX IS approval? Any voltage between 10-28Vdc between the connections to the transmitter. What is different about the barometric version of the DMP331 compared to a standard pressure range? To improve measurement performance of barometric measurements the 4-20mA output signal of a pressure transmitter is scaled from 800 to 1200 mbar absolute. Typically a pressure transmitter is calibrated at 5 points over its range to ensure it is inside specification. If a 0 to 1 or 1.5 bar absolute range is used to measure the barometric pressure you will only be using the pressure transmitter over a narrow part of its range and most likely only 1 or 2 of the calibration points will be inside the barometric pressure range. 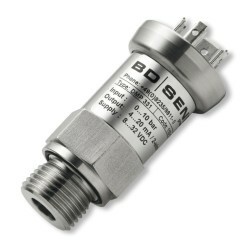 By scaling the current loop output signal of the absolute pressure transmitter to the barometric pressure range each of the 5 calibration points which are equally spaced between the lowest and highest measured pressure will be inside the region of barometric measurement and thus will provide a more robust verification of the pressure transmitter’s performance. The effective increase in signal output over the barometric pressure range also allows the most use of the bit resolution available from the instrument measuring the output signal from the barometric pressure transmitter. We have a vacuum drying process and need to trip alarms when the target vacuum of 10 mbar absolute is reached and when the vacuum chamber returns to atmospheric pressure so the operator knows when it the chamber is fully vented so that the lid can be opened easily. What instruments would you suggest to achieve this? Our suggestion would be to use a low absolute reference range sensor such as the DMP331 to ensure the pressure goes below 10 mbar absolute, it’s lowest range is 0-100 mbar absolute. Since the other trip alarm needs to trigger at zero gauge pressure rather than a fixed absolute pressure, we would suggest an additional gauge reference sensor to measure the suction pressure, and the DMP331 also has a 0 to -1000 mbar gauge to cover this over higher range up to atmospheric pressure. To complete the set-up we would then suggest connecting each sensor to a separate display with a trip alarm such as the SRP94. If I was to use this sensor in a hazardous (explosive) environment such as on a Natural gas line within a commercial building, would it need to be intrinsically safe (ATEX approved)? ATEX is only applicable if the whole installation is to be ATEX class approved, typically this is only required if their is a potential danger of a flammable gas atmosphere such as petrochemical plant or an automotive paint shop. Our experience is that boiler rooms in commercial building do not require ATEX approved installations. This HSE page states that “…Low pressure pipelines carrying mains gas to gas burning equipment have not traditionally been considered as sources of hazardous leaks, and area classification has not been applied in such circumstances….”. If it is decided that you must use ATEX approved intrinsically safe sensor it will only be ATEX compliant if installed to ATEX standards and with other compatible intrinsically safe equipment such as zone barriers and suitable wiring between the hazardous area and the safe area where the control instrumentation normally resides. Is the flush diaphragm option for the DMP331 precision pressure transmitter only available in 1/2 BSP? Is there a limitation on accuracy with different flush diaphragm connection size, e.g. 1/4 BSP compared to 1/2 BSP? The minimum flush diaphragm size is G1/2 (1/2 BSP) male for the DMP331, any smaller than this and the sensitivity and performance of the device will be affected. This is because as the isolation diaphragm gets smaller it becomes stiffer and much less flexible to changes in pressure. The purpose of the isolation diaphragm is to protect internal sensor components and provide one basic material to the process media and therefore it has to be as thin as possible to allow the pressure to be transferred without any losses. To counteract the performance losses associated with a smaller isolation diaphragm, the isolation diaphragm must be made from a thinner material. However there is a limit to how thin the material can be before manufacturing the sensor becomes impractical or the isolation diaphragm becomes too vulnerable to mechanical damage. I am looking at pricing and lead time for a pressure transmitter to measure natural gas pressure at an extremely low range of 0 – 100 mbarg, with 4-20mA output signal, 2-wire (loop powered) signal wiring connections and ¼” NPT pressure connection? Please could you provide the part number & specification for a transmitter with a range of 0-6 barg, output of 0-20mA 3 wire, 1/4″ BSP male connection, and DIN 43650 plug & socket elec. conn.? I’m looking for a pressure sensor to measure a device chamber leakage. The operating pressure is about 80 kPa, and I need to detect if the pressure drop is greater than 0.5 kPa. Do you have a sensor that you would recommend? How do I choose the sensor based on accuracy? Does it need to be half of the pressure drop that I’m measuring? Is there a formula or rule of thumb when it comes to selecting the accuracy of the sensor? For leak testing, measurement resolution tends to be the maim parameter considered for detecting a change rather than accuracy, particularly if the sensor technology is very stable such as silicon strain gauge technology. A 10:1 ratio between the required increment to detect and the measurement resolution should be more than adequate, so a sensor with a 11 bit resolution output in your application should be sufficient, such as the DMP331 with standard accuracy. If you want detect a change of 0.5 kPa then we would recommend a resolution of 0.05 kPa so you can measure 0.55 or 0.45 kPa change. 11 bit resolution will provide ~2000 measurement points so it will better than 80/0.05 = 1600. Does DMP331 generate digital output (hence the resolution definition based on number of bits) and converted with DAC to 4-20mA? The DMP331 uses a digital amplifier so the transducer, which is analogue, is converted to digital, and then back to analogue. 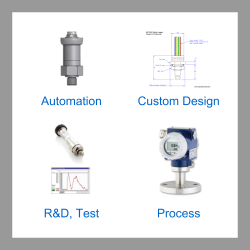 Please select the options you require for the DMP331 Precision Pressure Transmitter in your application and request a quote. Send us your enquiry for DMP331 Precision Pressure Transmitter to get assistance with this product type.